Fresh Start has other program locations besides Warner Springs. Do you want them as well? Eventually, but not right now... as mentioned earlier in the thread, Ethercat has given me her cheat sheet for navigating the different names and finding the main addresses on Narconon Reviews. 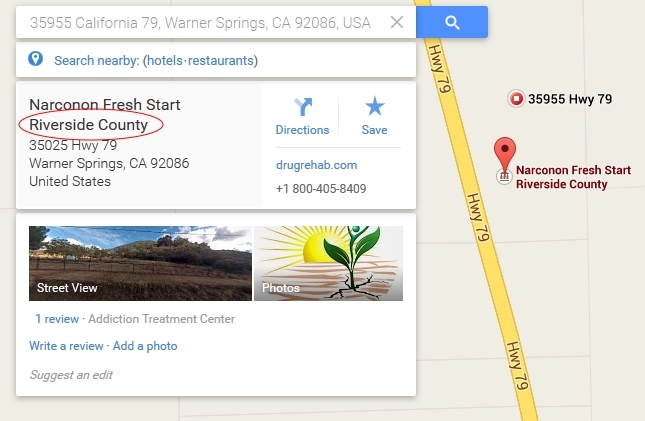 Narconon Fresh Start d/b/a A Life Worth Saving = 5 lawsuits = POTENTIAL TARGET #4? The question is, is that true or is it just another fake name? I'll go with fake name pending checking the county border. Thanks. Ever since ADP changed/morphed into the health and community services, I can't find things well on their website. I got my link from the state site as well. They also own the house across the street from the Lodge facility to house staff, one other place not sure if they own or rent is in between the Lodge and the Big House. I believe it was referred to at one time as the Blue house. I just remembered they also own the house next to the Lodge facility (west) it was purchased at the same time as the Lodge complex but is not part of the licensed facility. It may take some time but I will try and get you the addresses for house across the street, Blue house and the house west of the lodge complex. I'm gonna attempt to find these other housing facility locations by county parcel info + Googlemaps before I file the first records request. But if I can't figure the exact addresses out by tomorrow, I'll just file another request later on once we do have them nailed down. Sunshine - Monday works. I'll hold off on filing the first records request until then. Mary - no you gave me correct addresses, and ones Sunshine had posted earlier in this thread. But Sunshine also knew of a few EXTRA housing properties that have never been documented before. Which we still need to nail down exact addresses on. Thanks. However, I think he and are are talking about the same locations. He's the one who found the 3 posted at the state sometime back. I guess we'll wait and see. In addition to the main lodge address, and the ranch address, I need to also account for the barn, big house, top house, blue house, house across the street and adjacent house to the west. Fortunately, two of those housing locations share the same address as the rehab building address. But I still need the few extra ones - blue house, house across the street and adjacent house to the west - and then I'll need to look up the last sale dates on those extra addresses and determine if I need to account for start date of police record requests. This one looks to have lots of names, but only one address? EDIT: Fort Collins PD records division confirmed the redwood street addy is their jurisdiction and not Larimer Co. Sheriff's Dept. Our list of names is for all names known to have been used for all Narconon programs in Colorado, whether still operating or not. There is no "Narconon" corporation in CO. Narconon Fresh Start, in CA files as Narconon Fresh Start d/b/a A Life Worth Saving, Inc.
All income and expenses for this entity are included in Narconon Fresh Start 's 990 tax forms, as are also Narconon in TX and the Southern CA facilities ( which has several fictitious names and was formerly run as a separate corp.. which is discussed elsewhere on the forum) Narconon Southern California, a CA corp became Narconon Fresh Start in 2010 as a corp name change. However, there are 2 active entities operating in Colorado. It's very confusing, as the true and fictitious names and are intertwined at different point in time and filed with the Sec of State under different names. Here is the trade name summary of Narconon Colorado - A Life Worth Saving as a dba of "a life worth living"
Here is their 2013 description of accomplishments for each of the services they list as providing. It appears that this is just an FSM group, and not a direct service provider, except in line one of the return it's primary listing is Drug Rehabilitation and prevention of substance abuse"
Both are using th Redwood address.